I just recently put my plant in a new pot, and the leaves are folding in on themselves. What can I do to same my plant? 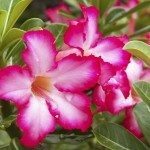 It is probably reacting to the repotting, which was probably unnecessary as Desert Rose does just fine very tightly potted so it is not as easy to inadvertently over water. Be sure to water very sparingly now. 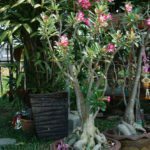 Yours would benefit from pruning back the many leggy stems.